A small, bright yellow Goby. Inhabits coral reefs and are often found perching on the branches of staghorn corals. They are native to the western Pacific from south Japan to the southern reaches of the Great Barrier Reef. 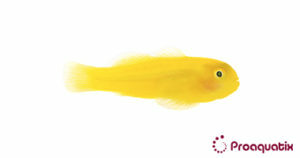 Yellow clown Gobies are peaceful fish that are best kept with passive species.